Promote hand-muscle strength and increase endurance. Composed of silicon rubber. Exercising with colorful Rainbow PuttyTM helps promote increased range of motion, finger flexion and tendon gliding.Colors indicate varied resistances, making it easy to create individualized hand exercise programs. The color system offers a way to quantify and chart progress, while motivating clients to advance to the next resistance level. 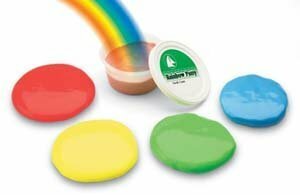 Extra-Soft Tan is an ideal starter putty for persons with very little hand strength. Available in packages ranging from 2 oz. to 5 lbs. (57g to 2.3kg).